Soprano ukuleles are hot these days. Believe it or not, these cheerful little instruments were first introduced in the 1800s when Portuguese immigrants came to Hawaii. Since then, their popularity has spread and people everywhere are happily making music with their ukuleles. Of the four most common ukulele sizes, sopranos are smallest – they’re also the same size as Hawaii’s original ukuleles. Now that you know a little bit about the ukulele’s history, it’s time to choose the one that’s right for you. We spent hours reviewing some of the most popular soprano ukuleles, analyzing hundreds of Amazon reviews along the way. This list of ten top soprano “ukes” (as they’re affectionately known) includes options at different price points to satisfy most budgets and meet the needs of entry-level players as well as those with more experience. All get high marks for their sound, overall quality, and playability. We’ve included lists of pros and cons for each model, along with a ukulele buyers’ guide complete with considerations to keep in mind when making your purchasing decision. This fantastic ukulele offers a clear, happy sound that makes playing and listening pleasant. Like almost all new ukuleles, it takes some time to break in; players report that they must often re-tune after each song during the wearing-in period. The Hricane UKS-1 Matte Soprano 21-inch Professional Ukulele Starter kit includes a fitted gig bag with a removable shoulder strap and an exterior compartment for accessories. Buyers appreciate the protection offered by the 30-day money-back guarantee and 12-month seller’s guarantee against manufacturing defects. This is a perfect entry-level ukulele; it’s fun and easy to play. 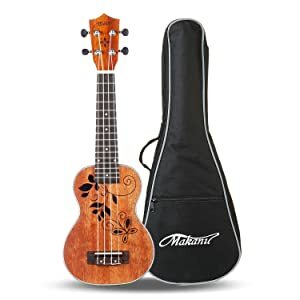 The ukulele and the bag are of good quality – better than I expected at this price. It’s got a great tone and you get a lot for the money. My daughter loves it, plus the sound is excellent. The action and tuning are better than any of the 9 others I’ve purchased, especially at this price range. Who should buy this uke? The Hricane UKS-1 ukulele is ideal for casual players of all ages and experience levels. 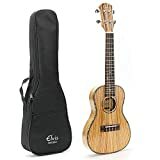 It’s not a top-of-the-line instrument, however the manufacturer pays good attention to detail and produces ukuleles that sound good and are comfortable to play. Experienced players who are looking for a good-quality travel ukulele might find this one ideal. 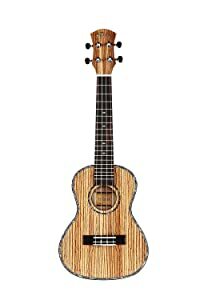 The Lohan LU-S Soprano Ukulele features a beautiful Sapele and Mahogany top, back, sides, and neck. It is handmade and comes complete with contrasting ABS bindings and white Aquila strings for a classic appearance. The rosewood fingerboard, chrome diecast tuning gears, and arched back add to the instrument’s quality. Thanks to quality materials and craftsmanship, this ukulele offers a warm, bright sound with plenty of volume. This ukulele arrives with two strap buttons pre-installed. A neck strap is included, along with a padded case and a tuner. Other extras include a spare set of strings, two picks, and a pick holder. The manufacturer also includes bonus video lessons. The Lohanu LU-S soprano ukulele comes with a lifetime warranty. Probably one of the better deals you’ll find in a beginner uke. It’s worth the money! Very pleased with the quality construction and attention to detail. I am impressed with the tone and intonation of this well-made ukulele. Fantastic ukulele for a fantastic price. Looks and sound beautiful! The accessories in the bundle allow you to start playing your ukulele right away. This is a real instrument – not a toy. The Lohanu LU-S Soprano Ukulele offers a step up from a basic entry-level ukulele. While it’s ideal for those who are ready to take their playing to the next level, it’s also a good choice for beginners who want to skip the frustration that often comes with cheap ukuleles. The online lessons offer added value; beginners learn how to tune their ukuleles, plus there’s an introduction to some of the most popular “must learn” Hawaiian ukulele songs. Offering a classic look and a warm, bright sound, the Donner DUS-1 Soprano Ukulele features a mahogany body and neck, and arrives with contrasting white carbon nylon strings. Its rosewood bridge and fingerboard add to the instruments pleasing appearance, and the chrome-plated tuners are of good quality. This ukulele features 15 brass frets with position marks for easier playing. Extras include a neck strap, a clip-on tuner, and an attractive gig bag with a zippered compartment for accessories. The manufacturer offers a no-risk, 30-day unconditional money back guarantee. Smooth sound with excellent clarity. For the money, it cannot be beat! It exceeded my expectations. 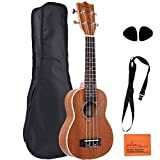 Affordable, quality ukulele packed with extras! 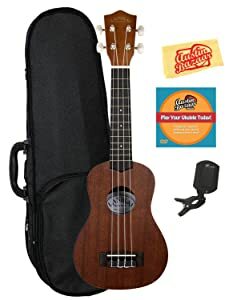 This is the perfect pack for an aspiring ukulele player or a seasoned veteran. As a novice, I’m not willing to spend hundreds of dollars on an instrument to learn on; this comes at a great price. Donner has a reputation for crafting quality instruments, and this one consistently meets players’ expectations. While it’s priced to appeal to serious beginners, more experienced players will appreciate its comfortable feel and its classic, mellow sound. Thanks to its concave back, the Elvis Zebrawood Soprano 21” ukulele offers a lovely sound with plenty of volume and outstanding resonance. Its entire body (top, back, and sides) are made of stunning zebrawood with a clear finish that shows off the wood’s grain beautifully. This soprano uke comes with Aquila strings, and is fitted with an ox bone nut and saddle as well as a rosewood fingerboard and bridge. A soft-sided carry bag is included for convenience. Not as clean-sounding as my $300 Kala, but at this price it’s amazing. Easy to play, and not too twangy. Great quality, stays in tune. Clean and beautiful sound, great price! I am highly satisfied with my purchase. Looks almost the same as a $249 ukulele from a local music store, and sounds just as nice. Highly recommended as a first uke. The Elvis Zebrawood Soprano Ukulele gets high marks in every department, making it a good choice for players who are ready to transition from a cheap uke to a better quality one. 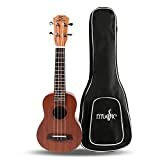 At the same time, its price isn’t overly prohibitive; it’s a good choice for anyone who wants to learn how to play the ukulele without some of the common problems found in cheaper instruments. Simply designed, sweet sounding, and crated to please beginners and more seasoned players alike, the Kala KAA-15S Soprano Ukulele features a mahogany body and neck. Its rosewood bridge and fingerboard provide a subtle touch of contrast, as do the white Aquila nylgut strings. A soft satin finish puts the wood’s grain on display. This ukulele features 12 brass frets and three fret position marks. Dynamic and resonant, with great harmonic content. Chords ring and project very well; excellent playability. This is the perfect beginner uke. It’s a quality instrument for practicing, but inexpensive enough that I wouldn’t feel guilty if I failed to learn. Played great out of the box and looks even better than it plays. Absolutely wonderful instrument. 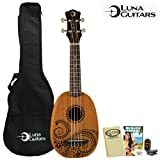 Great starter ukulele but good enough to rival some ot he $200 ones as well. 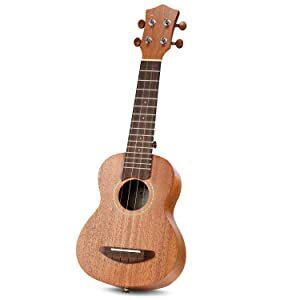 Thanks to its affordable price, the Kala Mahogany KAA-15S soprano ukulele is an excellent choice for a beginner who wants to enjoy learning and keep playing the same instrument as his or her skills improve. Most reviewers provide positive feedback on the ukulele’s sound and playability, often comparing it to more expensive models. For this reason, the Kala KAA-15S is also a good choice for a more experienced player who wants a travel uke or who wants a budget-friendly option. With a mahogany body and a shaved soundboard, the Fender Piha’ea Soprano Ukulele offers a traditional look and plenty of wood in its tone. The open tuners are beautiful, with engraved gear machines and vintage-look buttons. There are 17 fret marks on the rosewood headstock, which matches the rosewood bridge. Black neck and body binding add contrast. The headstock is marked with the Fender logo, adding to the ukulele’s attractive appearance. This is my 6th ukulele, and by far my favorite. Not prettiest or most expensive, but it sings remarkably. Looks cool and sounds great. Fun and easy to play. The ukulele holds its tune well once the strings have had a chance to set. Pickups sound raspy and plinky compared to my Kala, Ovation, and Godin ukes; OK for practice but not for performance. A sweet butterfly and vine tattoo design adds a creative touch to the Makanu Mahogany Tattoo Soprano Ukulele. This beautiful instrument features a mahogany body, enclosed chromatic tuning pegs, and bone nut and saddle. Its rosewood fingerboard and bridge provide contrast, as do black bindings. As with all new strings, these take time to break in. The ukulele needs to be re-tuned frequently during the breaking-in period. Great ukulele for a reasonable price. Bought this ukulele for a class and it’s awesome to learn on. My teacher said it’s a high quality instrument too; would definitely recommend! Sounds great and looks more expensive than it is. The tone is beautiful, and the quality is better than expected. My son loves it and has not stopped playing it since it arrived. Very happy with this ukulele. The Makanu mahogany tattoo is a lovely soprano ukulele, with feminine details that catch the eye. It’s perfect for girls and teens who are just starting out with the ukulele, and its sound and playability make it a nice step up from an inferior instrument. While it is not designed for professionals, it is nice enough for experienced players to use for practice or as a travel uke. Offering a classic oval shape and a beautiful design, the Luna Mahogany Series Tattoo Soprano Pineapple Ukulele is available on its own or as part of a bundle. The ukulele is crafted of select mahogany, and features a rosewood fingerboard with 12 frets. A gorgeous geometric motif based on traditional Hawaiian tattoo designs adds even more beauty. The bundle option includes a Gearlux hard case, an Austin Bazaar instructional DVD for beginners, and a clip-on tuner. A useful polishing cloth helps ensure that the instrument always looks its best. I didn’t expect a uke under $500 to be anything like this. Easy to play and very addictive! Pretty awesome for the money, with a good fit and finish. I was surprised to find that there was a free gig bag tucked inside the hard case. Great deal on the bundle! Nice-looking uke and perfect for those starting out, maybe even good for advanced players. If you’re looking for a nice pineapple ukulele with an attractive design, then this one is well worth a look. 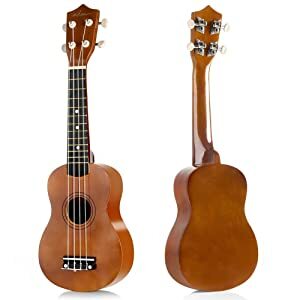 Although it’s not the most expensive, highest-quality ukulele available, it gets excellent reviews from most users, and some even mention using it onstage. For this reason, this little pineapple uke makes a nice all-around instrument for all players, from beginner to pro. The Lanikai LU21-S combo begins with the ukulele itself: a traditionally designed instrument with a gorgeous nato top, back and sides, plus a rosewood fretboard and lovely white binding for an attractive, well-balanced appearance. Geared tuners help the instrument stay in tune for long periods of time once the strings have had a chance to stretch and break in. The bundle includes a Gearlux hard case, a clip-on tuner, and an Austin Bazaar instructional DVD. A polishing cloth helps you keep your ukulele free from dust and smudges. The strings on this ukulele take time to break in. The ukulele needs to be re-tuned frequently during the breaking-in period. Great quality for a low to moderately priced uke. Very easy to play, perfect for beginners! My friend who plays really well likes it, too. 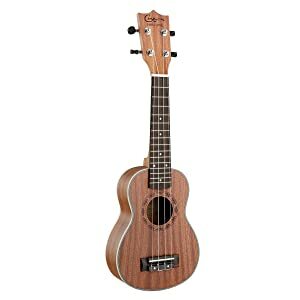 This is a very nice ukulele at an affordable price, and it’s ideal for beginners, thanks to the instructional DVD. More experienced players who want to take a step up from a cheaper instrument might also like the Lanikai LU-21. With a lovely satin mahogany finish, this ADM Soprano ukulele features chrome diecast tuners, Aquila strings, and a contrasting rosewood fingerboard. There are 12 brass frets, plus three fret position marks. The closed tuners add an extra touch of quality. This starter pack comes with a gig bag, strap, and picks. The sound is warm and rich, with plenty of cheerful “ring” to the notes. Great quality; nicer than expected! This ukulele looked nice in the photos; it’s even more beautiful in person. Highly recommend for newer ukulele players. Very happy with this ukulele. I had to tune it more often in the beginning, but much less now. This is a nice kit for beginners, and it’s also ideal for children. The ukulele’s quality components and appealing sound make it an attractive option for those with more experience who are looking for a mid-range ukulele to replace a lower quality one, as well as for those who want a nice travel ukulele at a price that won’t break the bank. Player’s Level of Experience- A brand-new player – especially a child – won’t typically have any expectations as far as the quality of sound is concerned, as long as the instrument sounds reasonably good and can carry a tune. Many cheap plastic ukuleles fall short in this department, leaving new players feeling frustrated, and often causing them to give up. A low-to moderately priced ukulele like many of the ones that we’ve reviewed here will probably satisfy a new player, particularly if it comes in a bundle that makes it easy to tune the instrument and take it to lessons, the beach, camping, and parties. More experienced players demand higher-quality instruments, especially if they plan to perform. Mid-range ukuleles like several that we’ve reviewed here are ideal for use as travel ukes, and some models sound good enough to play for an audience. Construction and Materials- Time and time again, we’ve heard complaints about cheap ukuleles breaking after just a few weeks of playing, plus we’ve heard complaints about ukuleles made with poor-quality materials. There are some exceptions; but in general, cheap plastic ukuleles are often a complete waste of money. Soprano ukuleles sound warmer and richer when they’re made with wood, and they offer a traditional appearance that appeals to a variety of players. Die-cast tuners, especially geared ones, add a quality edge to a ukulele, as do frets and fret markers. The preferred number of frets and fret markers varies from one player to the next. Price- When you’re just starting out, you’re likely looking for a low-priced ukulele. After all, you’re probably not sure whether you’ll enjoy playing it or not. The good news is that it’s very easy to find a high-quality ukulele for a relatively low price. Most of the instruments we’ve reviewed here are under $100, and they’re designed to let beginners transition into more advanced techniques. While professionals tend to prefer custom ukuleles made with costly koa wood and other high-end options, most new and intermediate players are satisfied with less expensive options. Sound- A soprano ukulele’s sound is light and cheerful, lending a classic island sound to songs of every genre. 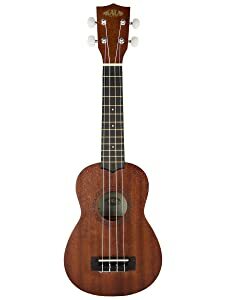 Cheap plastic ukuleles tend to sound very plinky, with quite a bit of buzzing and some unappealing snapping sounds; wooden ones on the other hand sound far warmer and much more sophisticated. Many manufacturers place clips of their instruments playing on their sales pages, so you can hear how the instrument sounds before buying it. This is a good way to ensure that you’ll feel satisfied with your purchase and enjoy practicing. 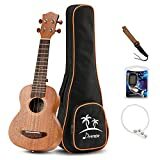 Intended Use- If you plan to take your ukulele camping or to the beach, it’s probably a good idea to purchase one that you don’t mind damaging. At the same time, your friends don’t want to hear unappealing music, so you want an affordable instrument that sounds good. Many of the top 10 soprano ukuleles easily satisfy both of these requirements. If you plan to take the spotlight with your ukulele, then quality sound and attractive appearance are two of the most important qualities to look for. 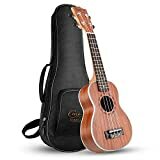 The good news is that you don’t have to spend a lot of money to satisfy your need for beautiful tone and great looks; a few of the most inexpensive soprano ukuleles sound surprisingly good, especially with aftermarket strings. 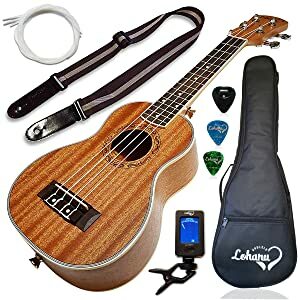 Accessories Included- For students, travelers, and people who want to play their ukuleles on stage, simple accessories like carrying cases, gig bags, and neck straps can make a difference. It’s true that you can purchase these separately, and many ukulele players opt to do just that. At the same time, bundles offer outstanding convenience. Beginners especially appreciate those that include instructional DVDs or a few online lessons.